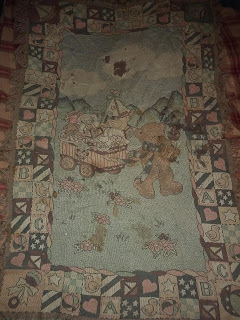 So the above image is of my baby blanket. It is pretty old as you can tell. 24 years old to be precise. I received it when I was six. Right after my first open heart operation before the recovery, another story for another time, my parents gave it to me. 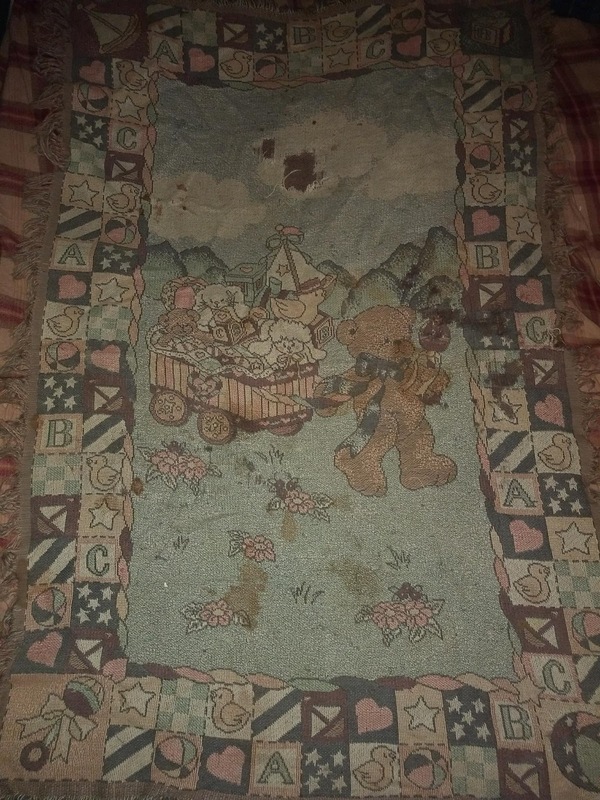 This blanket was one of the most important things in my early life. I took it everywhere, for a lot longer then normal I am guessing. When I went to school I would neatly fold it up and put it in the bottom of my backpack. If I stayed over at a friends house I would put it in my pillow case. It went everywhere, except outside. I left it in the house because outside was dirty and I wanted to keep it clean. One of the only memories I have from that Operation is an out of body experience, that I do not even know is real tho I have talked to my parents about this and they say it went just like I remember. So maybe the day off or the day after or a few days after, I do not know, my parents bought this and gave it to me while I was still sleeping after the Operation. They where both beside my bed, and my mom just laid it next to me along my side in the bed. I reached out just a little and grabbed it. But I remember this from standing next to my own bed, not from inside the bed. It fallowed me through my full recovery, that took months back then for a kid my age. Then fallowed me all the way to where I live now, tho I no longer carry it with me, I still keep it safe in a box in my bed room. It reminds me a lot of how much I had to go through and how much I needed things like a little old blanket and my parents to go through those things. I have thought a lot about what I might do with it, its a little to old and knackered to pass on to my kids of one day I have kids. I even thought I could frame it like one of those fancy wall tapestries, but I do not have a wall big enough to hold it. Maybe one day I will do that, I think it would be amusing, and nice to be able to see it every now and then. And it would make a great conversation peace. "Why do you have that old thing on your wall?" "Oh you know old memories and what not. ".